I would like to share some photos of the food we ate this week. First up, I ate this (huge!) 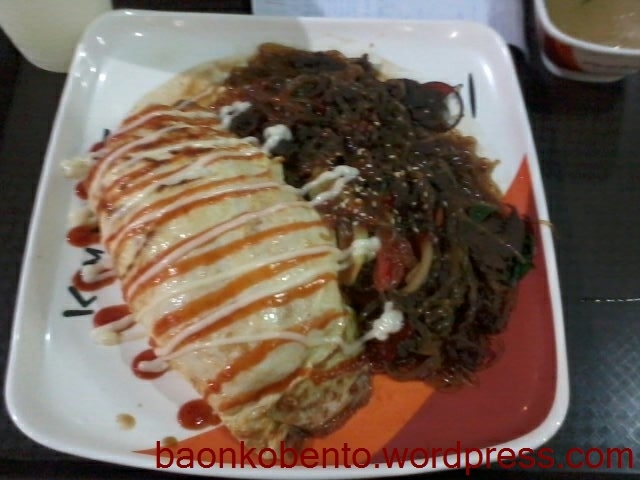 plate of beef omurice at Kim&chi food stall in Glorietta 4’s Food Choices last Wednesday. There’s a huge mound of rice inside the delicately cooked omelette, and it was accompanied with what is basically chap chae topped with beef. 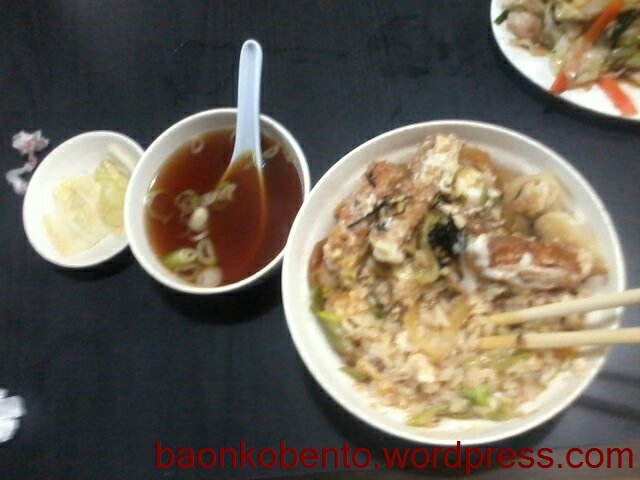 It was an awesome dish for only Php 120. In the following weekend we ate at a restaurant at Little Tokyo called Yamazaki. It’s a pretty busy place, and it has a connected Japanese grocery. My husband ordered a katsudon, Php 195. 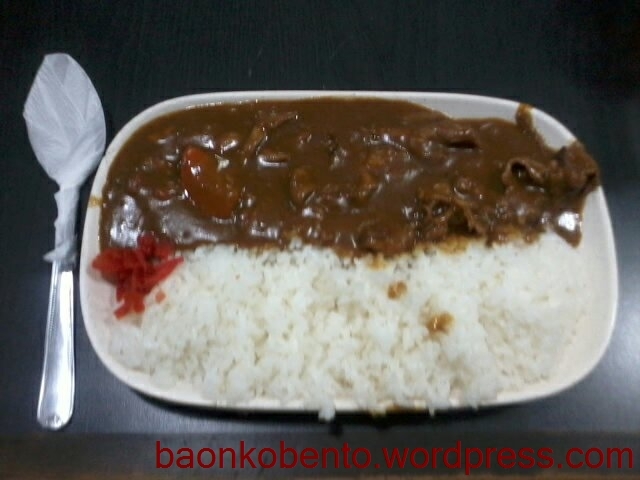 I had an order of beef curry (Php 215), and it was one of the best curry I tasted! I found myself wanting more rice because of it! 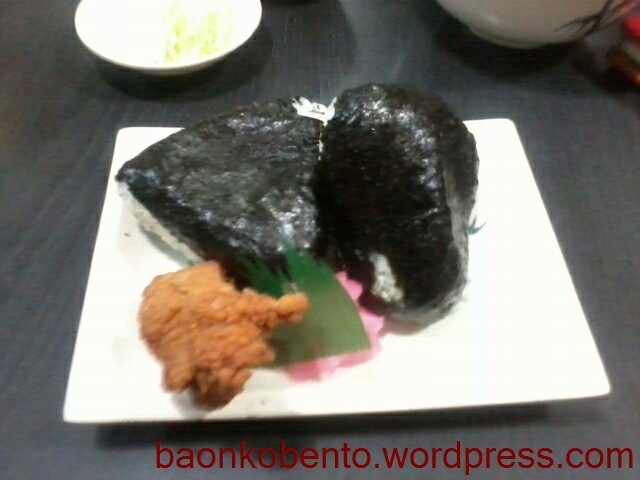 We also ordered a pair of onigiri on the side (Php 165), an ume onigiri for me and a salmon flakes onigiri for him. It came with a piece of rather dry fried chicken. 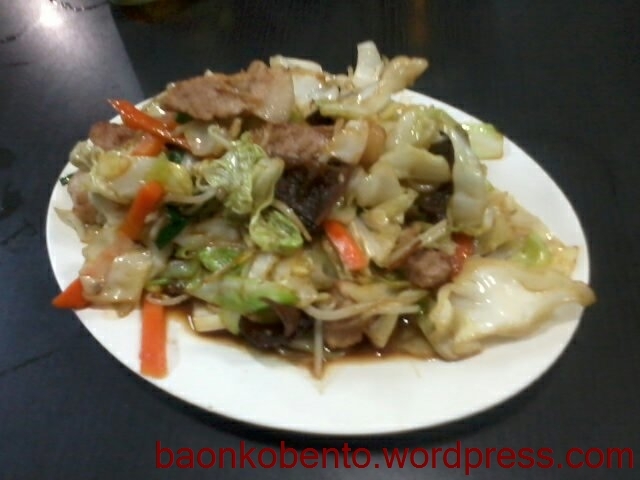 Lastly, we split an order of yasai itame (sauteed vegetables) with our friend Ruben. Finally, after a late night at the office we decided to eat at one of my favorite Chinese restaurants, Causeway at Libis. 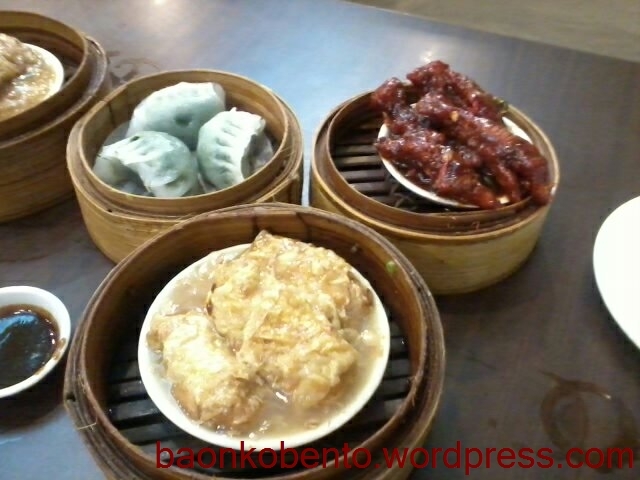 Since it was late night, their dimsum are at a reduced price (Php 52, I think?). 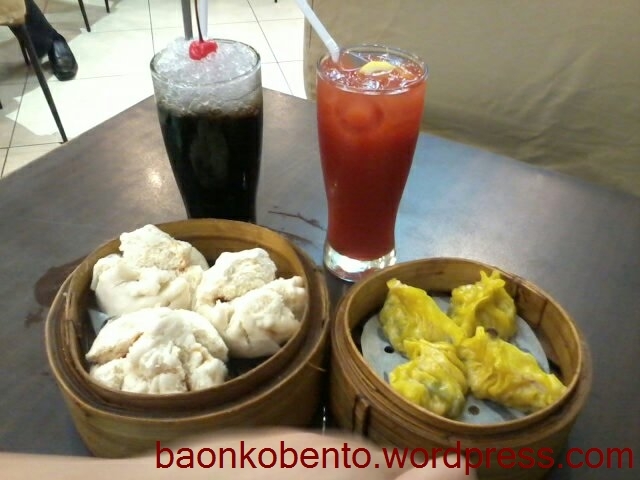 Our first order was off the dimsum cart, some asado siopao and sharksfin siomai, plus our drinks. We waited quite a bit for the rest of the dimsum, since it was already on an order-basis instead of having it in the cart. Here we had some kutchay, chicken feet, and beancurd rolls (my favorite!). 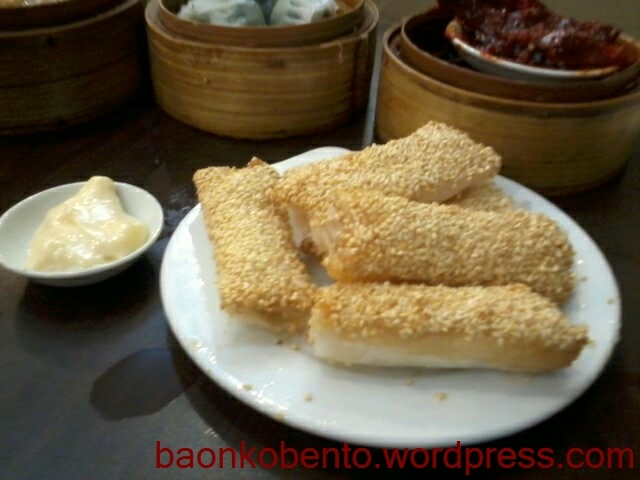 And also some sesame shrimp rolls. Goes really well with mayonnaise! And there you have it! I hope you liked the photos, they were taken by my phone’s camera only, so the resolution isn’t all that great. It appears to be Pasta Week at TheKitchn this week. As you may have read previously here, I am a huge pasta and noodles fan. I am absolutely enthralled that they are featuring my favorite type of food and I can’t wait to try out some of those recipes they posted. 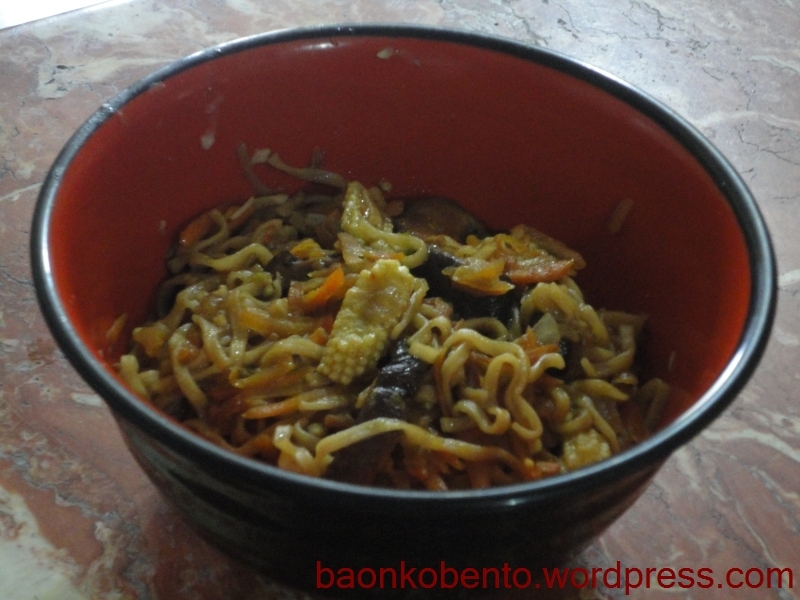 There are also some other sites that I visit that discuss noodles and the love for pasta. Another list of noodle recipes and a list of pasta sauces from TheKitchn are even more resources for pasta ideas. Sacha Chua discusses ramen love. What is a list about pasta without the amazing Ramen Rater? I always look forward to his next review; it’s like eating each of those ramen packs myself! If you know of other great pasta resources or would like to recommend your own recipes, I would be very happy if you could link to those in the comments! First off, I started with this really nice vegetable dish I found from The Pioneer Woman. It’s basically a bunch of vegetables cut in similar size and roasted. 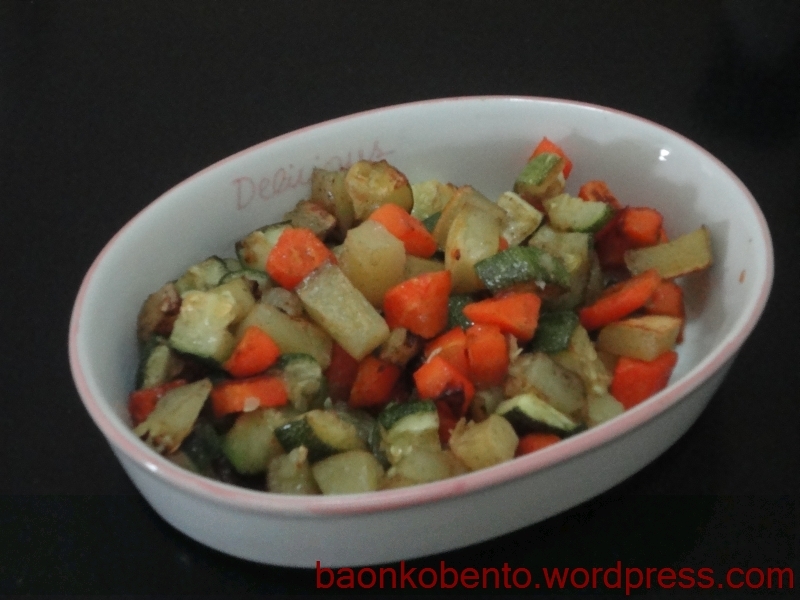 Here, I used a small and a large potato, a medium carrot, and a large zucchini. I seem to have put too much pepper, but it turned out pretty delicious! Addicting, even. I think this is because the whole thing tastes like some sort of chips or fries. 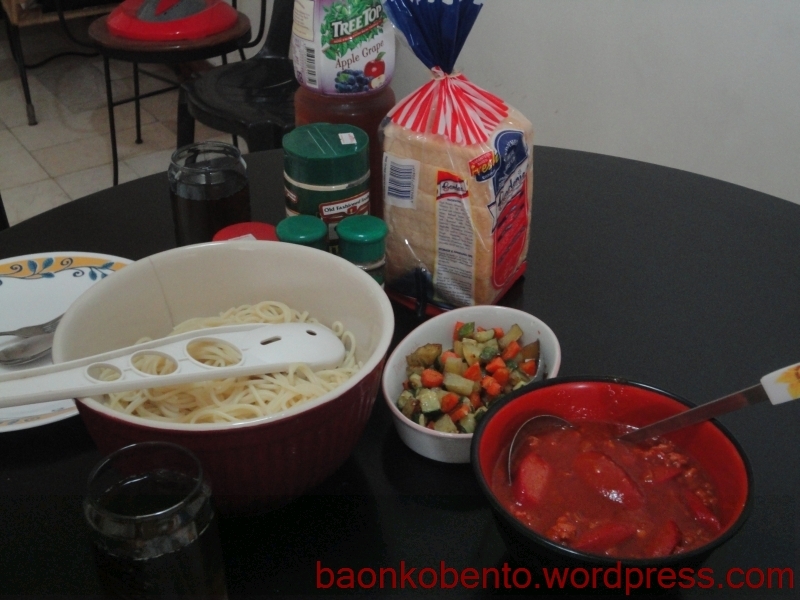 The second dish is Filipino style spaghetti. I’ve been meaning to try this out for the longest time because my husband prefers that to the Italian style spaghetti (non-sweet). 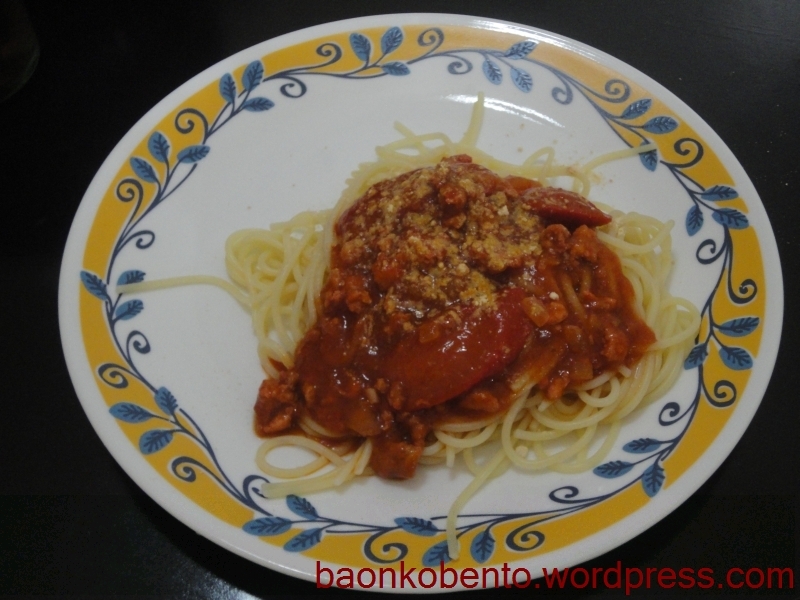 Good thing I’ve discovered Jun-blog, as he has a great recipe for this style of spaghetti. I mostly followed his recipe to the dot, except I substituted tomato ketchup for banana ketchup (turns out I didn’t have any?). It may have affected the overall taste and texture. My husband commented that it was a little bit too runny. Next time, I’ll use banana ketchup and see how it compares. I also used jumbo hotdogs so the slices were enormous! I’ll downgrade to regular hotdog next time. It was a very satisfying lunch! I was watching the Asian Food Channel, and the Japanese show Dosanko Cooking was on. I love this show because the host, Mrs. Hoshizawa, seems almost the Japanese equivalent of Julia Child. She’s very amiable and looks like she really loves what she’s doing. She teaches three simple recipes in her show, and that day one of them was carbonara. It seemed pretty simple when she was doing it, and it inspired me to try my own version. 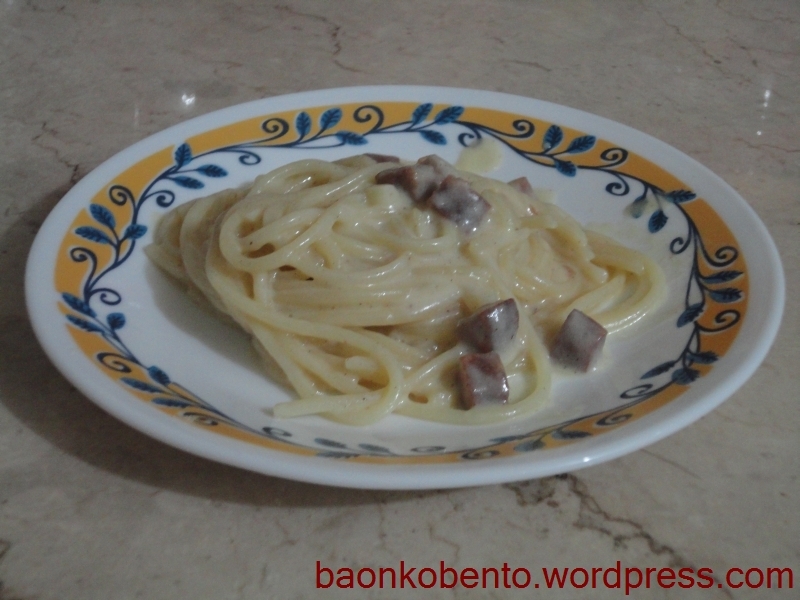 Her carbonara featured bacon as the flavoring agent, but as I didn’t have any I used chorizo instead. 1. Cook the spaghetti noodles in some water with a bit of salt, about 5-8 minutes. Set the whole pan aside (the spaghetti and the soaking water). 2. Add the flour to the grated cheese, and mix thoroughly. Set aside. 3. Melt the butter in a wide pan. Saute the garlic until limp and translucent. Add the chopped chorizo and cook for about 5 minutes. 4. Add the milk. Mix thoroughly and simmer for about 2 minutes. 5. Add the cheese-flour mixture. The cheese should melt shortly and the flour should help thicken the sauce. 6. Fish out the spaghetti noodles from the other pot and add it to the sauce. Mix thoroughly to coat the noodles evenly. If the sauce turns out a bit dry, add a tablespoon or two of the spaghetti soaking liquid. 7. Season with salt and pepper, then turn off the heat. 8. While the noodles are still hot, quickly add the yolk/s and vigorously mix to cook it in the residual heat. Serve immediately. The whole process turned out faster than I expected. You can of course use bacon as Mrs. Hoshizawa originally intended, in which case you might need to use less salt at the end. You can probably use different pasta shapes as well. Mrs. Hoshizawa also had some toppings (parsley if I remember correctly), so you might want to try doing that as well. It performed very well as a baon (although don’t try to use it past 4 days or something). As I have mentioned a lot here, I am a huge fan of pasta in general, and instant ramen in specific. I’ve been reading a lot about how to upgrade instant ramen past the poor-student-fare stage. I’ve decided to try going with my instincts this time, and see if I can come up with some Chinese style stir-fry noodles with instant ramen. 1. Boil the baby corn in enough water to just cover. Keep in boiling water for about 5 minutes. Drain, slice diagonally, and set aside. 2. Cook the ramen noodles (and any dried vegetable packets) and set aside. Do not use the flavorings. 3. In a wok or frying pan, saute the garlic and onions in the oil until limp. 4. Add the carrots, baby corn, and the optional mushrooms. Saute for about a minute. 5. Pour in about half a cup of the mushroom soaking liquid, or half a cup of water if mushrooms weren’t used. Simmer for about 5-10 minutes until the vegetables are cooked and liquid almost gone. 6. Add the cooked ramen noodles and the soy sauce and oyster sauce. Toss until everything is fully coated in sauce. Season with salt and pepper. It came out tasting like many chinese style noodle dishes I’ve had before. I like the fact that there are so many variations I can do on this recipe, and that it’s chock-full of veggie goodness. The only disadvantage here is the increased time of preparation, but I think the increased nutrition might be worth it. What do you think? Ever since I received the small glass casserole from my mother-in-law (which I used for the lemon cakes), I had been fantasizing about making baked pasta. I’m crazy about pasta, and I would gladly try anything to be able to cook my favorite kind of food. One of the Filipino food bloggers I follow, Trissalicious, has an amazing recipe for baked spaghetti. I decided that this is what I was going to try. I had to make a few adjustments right from the start, since my casserole is really tiny. I figured halving the recipe might be a good start. I ran into a bump right away. I had a bit of problem concerning the local term for coriander. I had thought that it was kinchay, but my father-in-law told me it looked like parsley. A search around the internet confirmed this, and also provided me the term wansuy to mean cilantro, which is another term for coriander. I had to go back to the supermarket to buy a bunch of wansuy instead. The next bump I ran into was the fact that I seemed to have too much spaghetti, and too little meat sauce. And that my casserole was still too small for half the recipe. And maybe too little of the bechamel sauce. Still, I plowed on ahead, and came up with a casserole and a smallish bowl of baked spaghetti. Unfortunately, I ran out of time and totally forgot to take pictures. I had sent the spaghetti to my in-laws, and it didn’t really last long enough for me to take pictures. It tasted great though, and the bechamel was awesome. I can imagine just making a batch of bechamel sauce, and pouring it over any baked dishes I make. I also appreciate the part where I learned about local terms of herbs. Last week I had a craving for mac and cheese. 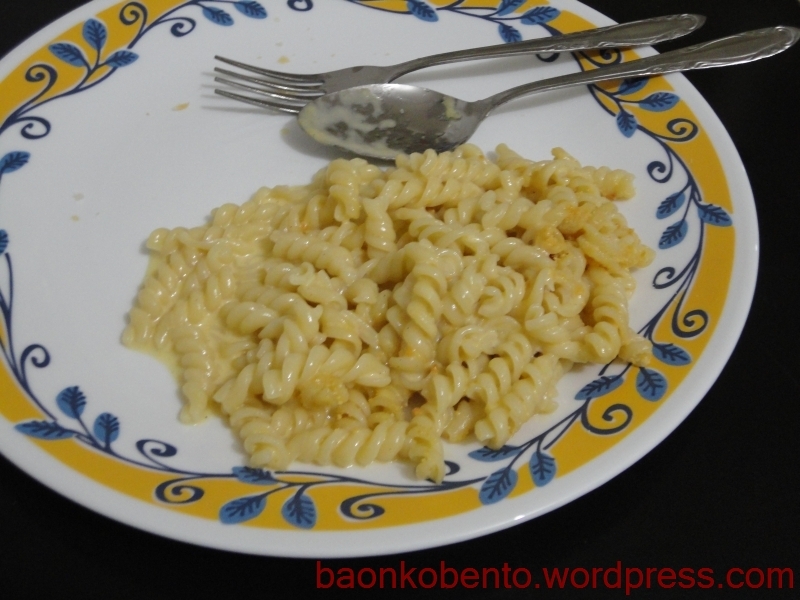 From my forays into the vaults of the internet, I discovered that it was actually pretty simple to make mac and cheese. It’s basically just cheese melted into heated cream, seasoned with salt and pepper. I decided to give it a try, using a brick of all-purpose cream and about a cup of shredded cheddar cheese. It came out pretty good, and there was a lot of the cheese sauce to make a lot of mac and cheese servings. Here’s one that my daughter ate for lunch that day. It’s mixed with twirly macaroni, sprinkled with Parmesan cheese. Here’s what I had. 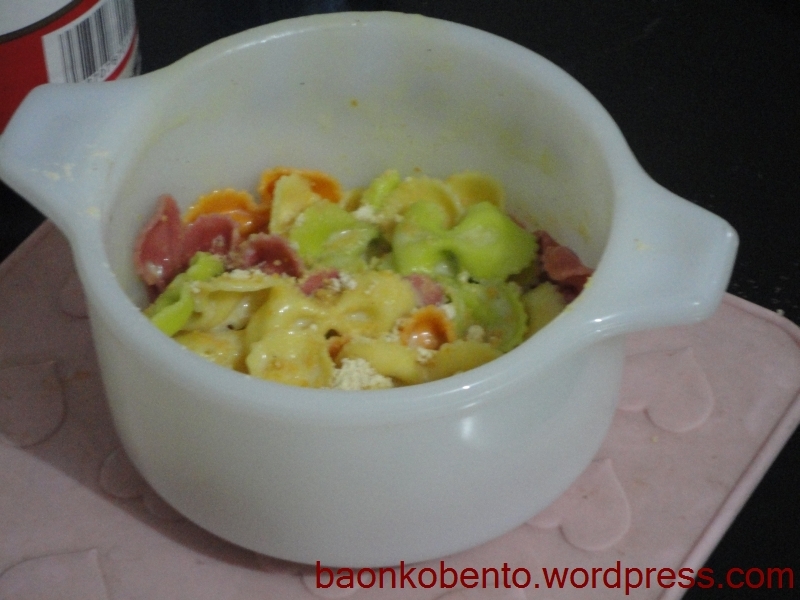 It’s some vegetable pasta in bowtie shape, topped again with Parmesan cheese. 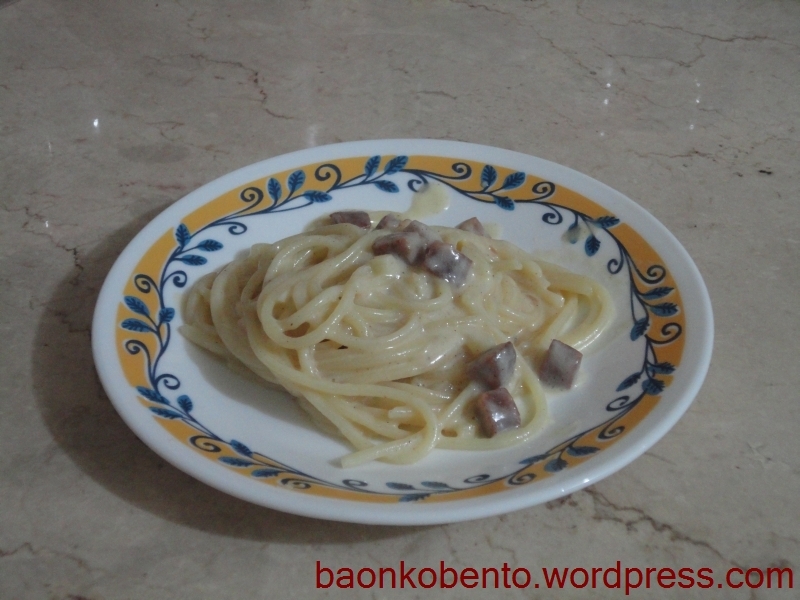 It also performs well as a baon, as long as the cheese sauce is packed separate from the noodles. It makes a great meal! Enter your email address to subscribe to Baon Ko Bento and receive notifications of new posts by email.